Meet the “Expendable Asian Crewmember”: From “Godzilla” to “X-Men” to “Total Recall,” why does every blockbuster need a single Asian guy to kill off? Fans of the original “Star Trek” television series, which aired from 1966 to 1969, are familiar with the old trope of the expendable Asian crewmember. Every week, one or two unlucky marginal characters, wearing the red shirt of a Security Officer, would join a landing party that usually consisted of Captain James Kirk, First Officer Spock, and Dr. Leonard “Bones” McCoy from the starship USS Enterprise. The trio would beam down to the planet’s surface along with the Expendable Crewmember – who would promptly get killed off by a space monster/mysterious sentient cloud/primitive hostiles. The Expendable Crewmember became such a routine part of the storyline that it was spoofed on the animated television show “Family Guy,” and became a running joke in the 1999 film “Galaxy Quest,” in which Sam Rockwell’s character, “Crewman no. 6,” is a nervous wreck named Guy, so forgettable to everyone that even he knows he’s doomed to die. As little kid, I found it a bit odd that the Klingons always missed Kirk and hit the guy in the red shirt standing next to him. And as I got older, I couldn’t help but notice two strange trends beginning to pop up in Hollywood summer blockbusters: 1) Random storylines would detour to someplace in Asia for no particularly good reason, and 2) One useless Asian character – only one – would show up and stick around just long enough to make a vague impression as a villain. Then he or she would die at the hands of the good (white) guys, who would then march off victoriously into the sunset. Which brings me to the 2013 “Star Trek” reboot, with Zoe Saldana as Lt. Uhura and John Cho as Lt. Sulu, plus loads of “Asian-like” aliens, including Vulcans. When the most diverse cast in a Hollywood summer blockbuster happens to be based on a television show that debuted a half century ago, it’s better to be the Expendable (Asian) Crewmember than not be allowed on board at all. But I’m hoping it won’t be another 50 years before Mr. Sulu not only takes the helm but gets his own ship – and can star in his own film. “X-Men 2: X-Men United,” 2003. Yuriko. The perfectly coiffed, impeccably manicured and silent assistant to evil mastermind Stryker, Yuriko turns out to be a super-villain called Lady Deathstrike whose abilities closely parallel those possessed by the Wolverine. Wolverine kills her by injecting her with the rare metal adamantium in its liquid form. “X-Men 3: The Last Stand,” 2006. Kid Omega. As the Mutant Brotherhood organizes against humans, Kid Omega becomes one of Magneto’s new recruits. Played by Ken Leung, he can project spikes out all over his body in the manner of an angry porcupine. He dies in a blast of psychokinetic energy unleashed by the super-mutant, Jean Grey/Phoenix. “Mission Impossible III,” 2006. Zhen Lei. Played by Maggie Q, this femme fatale joins the “Impossible Mission Force,” experiences a staged death, and disappears from the story. The fact that she is Chinese does not explain why the action relocates to Shanghai as opposed to, say, Southern California, which is also inhabited by white heroes plus a few Chinese people eating noodles. “Live Free or Die Hard,” 2007. Mai Lin. Once again played by Maggie Q, Mai Lin is a cyber-terrorist with nefarious plans that vaguely involve computer hacking. Bruce Willis blames her for the awful script and throws her down an elevator shaft. “The Dark Knight,” 2008. Lau. Played by Chin Han, Lau is a mob accountant who hides the mob’s money and flees to Hong Kong for the express purpose of getting Batman to Asia for an extended tourist commercial involving many tall, sleek skyscrapers. Batman brings Lau back to the U.S., where he is killed by the Joker. “X-Men Origins: Wolverine,” 2009. Agent Zero. A mutant expert marksman, Agent Zero, played by ethnic Korean actor Daniel Henney, not only looks fine in a tailored black suit, he has better hair than Wolverine. After many tries, Wolverine finally succeeds in mussing his rival’s hair by downing his helicopter and blowing it up. “Total Recall” (remake), 2010. Bob McClane. Played by John Cho, better known as Lt. Sulu from the “Star Trek” reboot, Bob gets killed off when he stupidly asks secret agent Doug Quaid about his feelings. This taboo question prompts a police raid that results in everybody except Quaid getting shot. “Red 2,” 2013. Han Cho-Bai. He is an international assassin sent to kill retired black-ops CIA agent Frank Moses. Moses is played by Bruce Willis, so you know he doesn’t get killed off. Neither does Han Cho-Bai (played by Korean actor Lee Byung-Hun), because he’s a red herring who is really a disguised sidekick. Though I enjoyed the display of his martial arts skills, he’s got no business being in this film except to sell tickets. It made nearly twice as much in foreign receipts as it did in the U.S., and the bulk of those tickets were sold in Japan and South Korea. “Godzilla” (remake), 2014. Dr. Serizawa. Played by the legendary Ken Watanabe, the Serizawa character appears in the 1954 version set in Japan, where he unexpectedly dies. Crucially, the original Godzilla hit U.S. theaters around the same time as the first wave of Asian immigrants, in the aftermath of WWII and the Korean War. Sixty years later, the newer, sexier version of the giant lizard suggests that Godzilla is a strong, charismatic, assimilated Asian-American who wants his own starring role in a summer blockbuster without so much goofy metrosexual makeup. 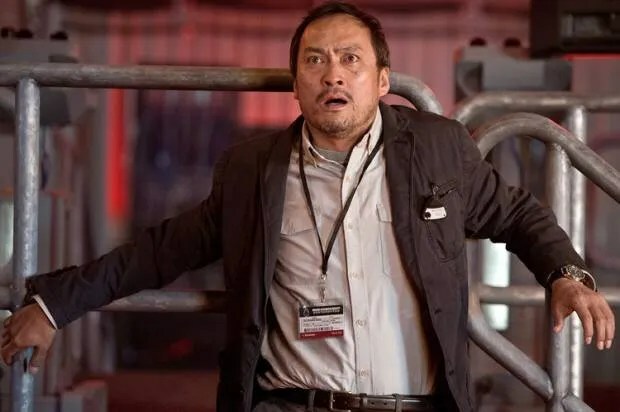 And just as some of the funniest Internet memes focus on the giant lizard’s new Hollywood look, it’s not a done deal that Serizawa’s character gets killed off this time around, even if he is the only Asian character with a name, thus adhering to the one-Asian rule. I guess you could call that progress.